Last week, I was over in Dublin having been invited to give a talk by my gracious hosts at the Irish Internet Exchange Point, INEX. I asked what sort of thing they might like me to talk about. We agreed that I’d talk about various trends in global peering, mainly because the INEX meeting audience don’t do massive amounts of peering outside of the island of Ireland. One of the discussions we had was what is meant when we say “Regional” when talking about Internet Exchange points? In the UK, we generally mean exchanges which are outside of London, such as IX Leeds. When a “Regional IXP” is discussed in Africa, they actually mean a “super-national” IXP which possibly interconnects several countries across a region. Why do the communities in these areas want IXPs that span national boundaries? There is a lot of suboptimal routing. Traffic being exchanged between adjacent countries on the same continent can end up making a long “trombone-shaped” trip to Europe and back. This has a negative effect on the user experience and on the local internet economy. There is already a well established exchange point in Dublin, INEX, with a good number of national and international members. Discussions are taking place between Internet companies in Northern Ireland (which, remember, is part of the UK) about their need for a more local place to exchange traffic, likely in Belfast. The current belief is a large amount of the traffic between sources and sinks in Northern Ireland goes to London or Amsterdam. So, I thought I’d do some RIPE Atlas measurements. This isn’t meant to be an exhaustive analysis. More just exploring some existing theories and perceptions. The first trick is to identify probes in Northern Ireland. From the RIPE PoV, these are all indicated as part of the UK (go and watch the video again if you didn’t get it the first time), so I can’t select them by country. Fortunately, probe owners have to set their probe’s location – there is a certain amount of trust placed in them, there’s nothing stopping me saying my probe is somewhere else, but most probe owners are responsible techy types. 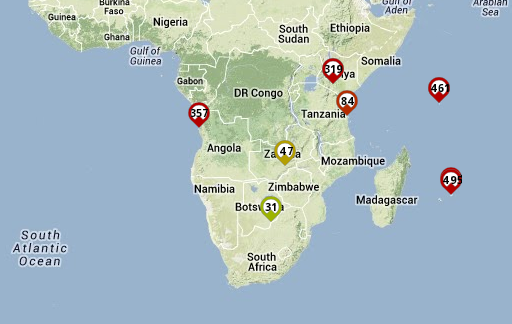 The RIPE Atlas people also put the probe locations onto a coverage map. I also needed some targets. Probes can’t ping each other (well, they can, if you know their IP address, and they’re not behind some NAT or firewall). The Atlas project provides a number of targets, known as “anchors”, as well as nodes in the NLnog ring which can act as targets. There’s an Atlas anchor in Dublin, but that couldn’t take any more measurements, so that wasn’t suitable as a target, but HEAnet (the Irish R&E network) and Amazon (yep, the folks that sell books and whatnot) have NLnog ring nodes in Dublin. We also needed targets in Northern Ireland that seemed to answer ICMP relatively unmolested, and I chose DNS servers at Tibus and Atlas/Bytel, both of whom are ISPs in the North. The final things to add were “controls”, so I chose a friend’s NLnog ring box which I know is hosted in London, and two other UK-based Atlas probes, the one I have on my network at home, and one on Paul Thornton’s network in Sussex. These effectively provided known UK-Ireland and UK-NI latencies to the targets, and a known NI-London latency for the probes in NI. So, we can see there are some variations, no doubt based on last mile access technology. In particular, the node shown here with the 54ms RTT (just North of Belfast) consistently scored a high RTT to all test destinations. Anyway, this gives us an idea of NI-London RTT. The fastest being 15ms. We can therefore make a reasonable assumption that if traffic were to go from Belfast to London and back to Ireland again, a 30ms RTT would be the best one could expect. 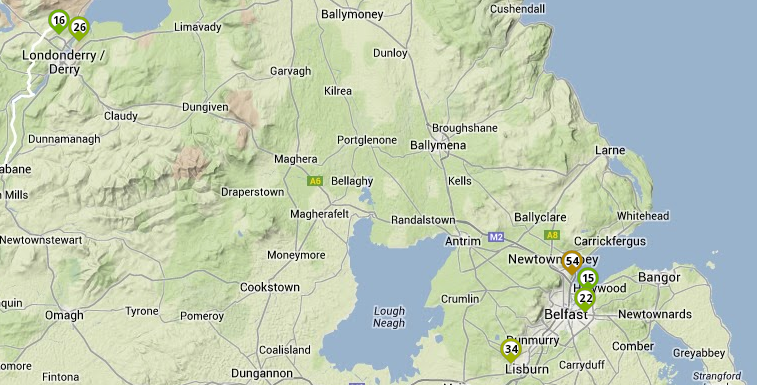 Only two of the probes in Northern Ireland have <10ms RTTs to the target in Dublin. All other probes have a greater RTT. It is not unreasonable to assume, given that some have a >30ms RTT, or have exhibited a >15ms gain in RTT between the RTT to London and the RTT to Dublin, that this traffic is routing via London. Of the two probes which show a <10ms RTT to HEAnet in Dublin, their upstream networks (AS43599 and AS31641) are directly connected to INEX. Of the others, some of the host ASNs are connected to INEX, but the RTT suggests an indirect routing, possibly via the UK mainland. Again, the same two probes show <10ms RTT to Dublin. All others show >30ms. Doesn’t seem to matter if you’re a commercial or an academic network. Finally, lets look at round trip times within Northern Ireland. Again, the same two probes report a lower than <10ms latency. 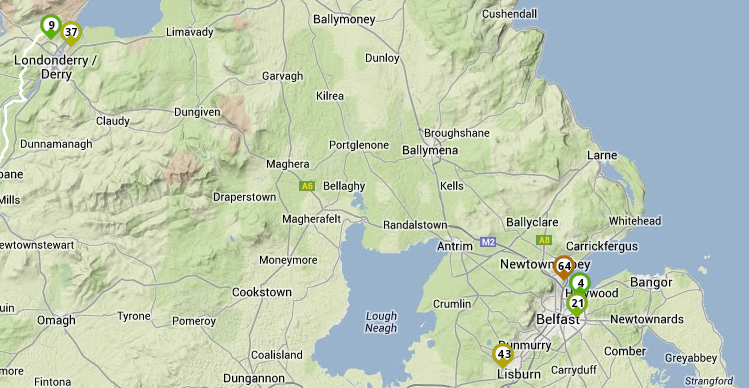 I’d surmise that these are either routing via INEX, both host networks are downstream of the same transit provider in Belfast, or are privately interconnected in Belfast. At least two of the other nodes seem to route via the UK mainland. Obviously, one of our probes is on-net, with a 1ms RTT! Of the others, we’re definitely looking at “trombone routing” of the traffic, in most cases back to the UK mainland. This may not be entirely surprising, as I’m told that BT don’t provide a 21CN interconnect node in Northern Ireland, so traffic on BT wholesale access products will “trombone” through the mainland in any case. So, what’s really needed in Northern Ireland? We’ve shown that if networks are willing to buy capacity to Dublin, they can happily exchange traffic at INEX and keep the latency down. An obvious concern some may have is the export of traffic from one jurisdiction to another, especially in light of recent revelations about systemic monitoring, if it’s NI to NI traffic. If the goal is to foster internet growth (e.g. 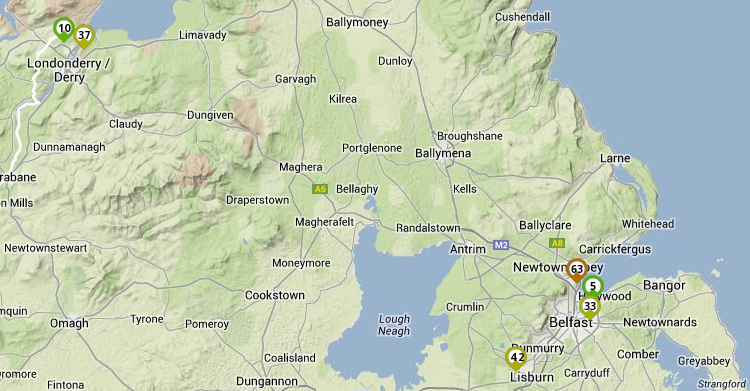 “production” of bandwidth) in Northern Ireland, where is it going to come from? Are Northern Irish interests better served by connecting to the mature interconnect community in Dublin? Is a BT 21CN interconnect in Belfast essential for growth, or can NI operators build around it? Should INEX put a switch in Belfast? If they do, should it be backhauled to the larger community in Dublin? Or is that somehow overstepping the remit of an exchange point?